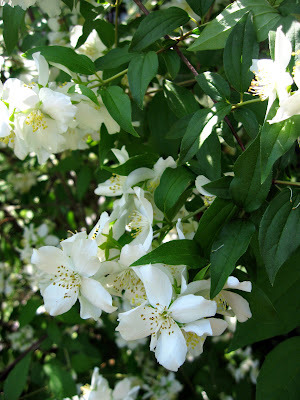 The Mock Orange in my garden is in full bloom again! 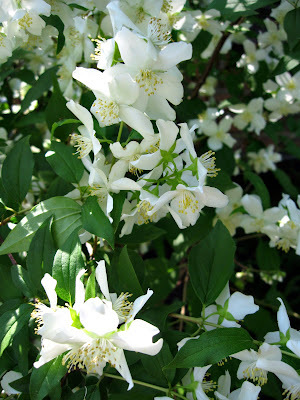 I love when this fragrant shrub opens it's beautiful white flowers and allows the air to smell a bit sweeter! 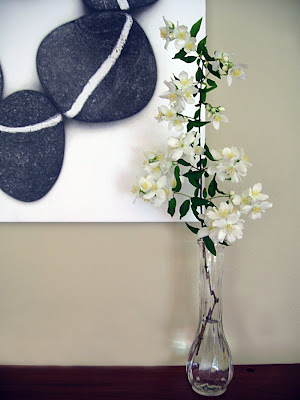 My Mom always tells the story of the Mock Orange she had planted outside their own home. It's the story which prompted me to buy my own shrub when my husband and I, with only baby Madelyn in tow, moved here! When I was just born, May 19th and on my Dad's birthday (what a surprising gift he received THAT year! ), my father snipped a bunch of stems from their blooming bush to bring inside to the new mama! Ahh, a story as sweet as those fragrant white flowers! The May Giveaway, hosted by SewMamaSew, is still running strong! Thanks to all the entries so far! I am enjoying reading all the responses to "the one thing you LOVE most about the summer!" If you haven't entered yet and would like a chance, click *HERE* and leave a comment!